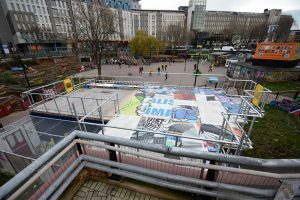 Situated in the Bearpit, the Bearpit Open Air Theatre boast a unique urban backdrop which makes it a stunning location for performances, concerts, exhibitions and other events. Update 2018: booking enquiries now have to go via the Council Site Permissions Event Team. 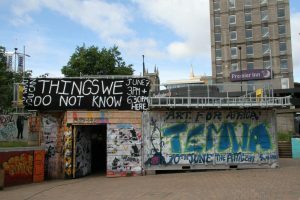 The Bearpit Open Air Theatre is located in the south corner of the Bearpit. 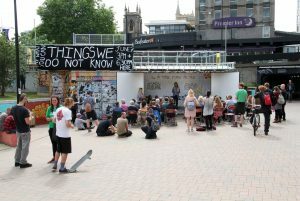 The stage sits on top of a shipping container which raises it to street level, hereby providing a unique urban background for a range of activities. 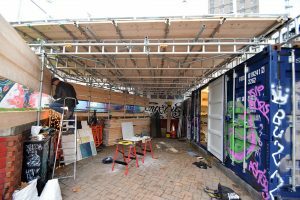 The height makes the Bearpit a perfect spot for an audience.The container is a place sheltered from the elements. 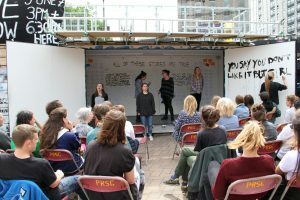 The Bearpit Open Air Theatre can be used as an indoor workshop/exhibition space, a covered stage, political rallies, debates, gigs/concerts, film screenings and so on. We think of the Open Air Theatre as a crossover between the Minack Theatre in Cornwall and the Globe Theatre, done PRSC style. The site and background sounds can be seen as a challenge, but we think it’s the ultimate versatile and exciting space around. A large backstage area. The indoor space and the backstage area are connected. There is currently no possibility of amplification, we are working on it!